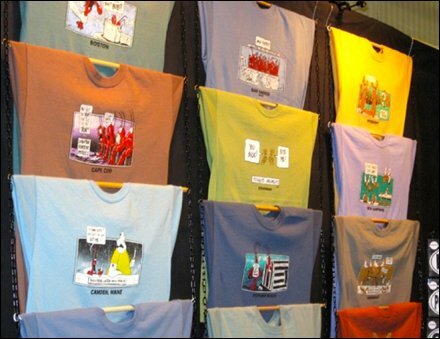 A simple Rod and Chain T-Shirt Display that requires only minimal, and even Do-It-Yourself, fixturing. 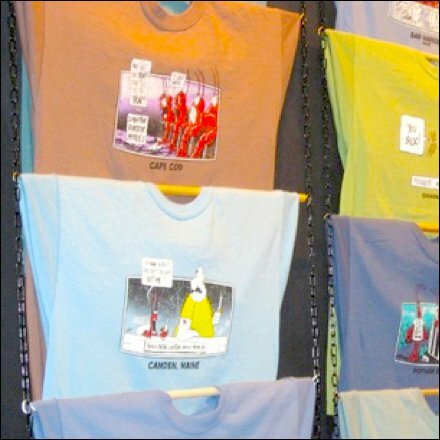 Simple wood cross bars supported by chain create vertical display space for T-shirts, where as always, the graphics and message are the “sell” and must be seen. See the thumbnail for more detail of the Rod and Chain T-Shirt Display then continue your Tee and T-Shirt outfitting researches below. This is an ongoing thread so stop back from time to time to monitor new concepts.